Though Geralt of Rivia's story may be finished in the video game universe, the hero's journey is far from over. 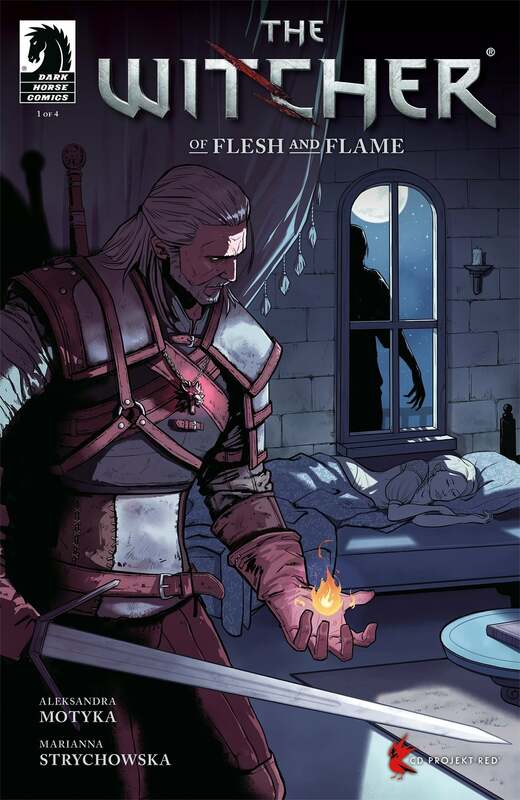 Dark Horse Comics and CD Projekt RED are teaming up once more for a brand new comic series called The Witcher: Of Flesh and Flame and it will be making its grand debut this December! Dark Horse gave us your exclusive first look at the new series and what it has to offer fans of the glorious RPG franchise. With The Witcher 3: Wild Hunt writer Aleksandra Motyka at the helm and art done by the talented Marianna Strychowska, the new comic mini-series is guaranteed to be the perfect addition to the lore so many fell in love with. "Geralt is summoned by an old friend to help solve a mystery involving his daughter. Upon his arrival, Geralt is surprised by another friend from the past and he soon finds himself transported to regions beyond his original expectations." The first of four issues goes on sale December 19th of this year, perfect for the holiday season! You can also pre-order it now through local comic shops, major retailers, and the Dark Horse site itself! Need a little help catching up on all of the characters in The Witcher? Dark Horse also has The Witcher Library Edition going on sale before the release of The Witcher: Of Flesh and Flame. The Library Edition will be live on October 24th ahead of the new comic mini-series' release. This compendeum collects issues 1-5 of The Witcher's House of Glass, Fox Children, Curse of Crows, and the one-shot Killing Monsters. It also has a sketchbook portion for those fans that just can't get enough of this amazing universe!